Like diamonds and sapphires and rubies, this gem begins far below the surface, in the porous limestone beds that form the Edwards Aquifer. The Aquifer is a vast subterranean reservoir stocked with billions of gallons of water. The portion of the Edwards that feeds Barton Springs begins in southern Travis County and northern Hays County and flows north toward the Springs. Waters in the Edwards Aquifer rise to the surface through underground channels at Barton Springs, then flow into Town Lake, where they contribute to the Colorado River. Humans have inhabited the area near Barton Springs for at least 11,000 years. Lipan Apache, Comanche, Jumano, and Tonkawa Indians used the Springs for generations. Franciscan friars built a mission near the Springs in 1730, and Anglo colonists first settled here in 1835. The City of Austin acquired the Springs and adjacent property in the early 1900’s from Andrew Jackson Zilker. 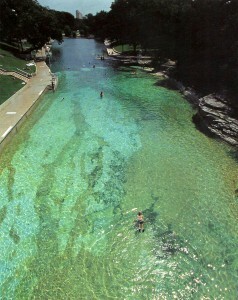 Barton Springs Pool was formed by damming a section of Barton Creek about one-half mile upstream of Town Lake. It is the 4th largest natural spring in Texas. Water temperature averages 68 degrees year-round. The pool is 997 feet from dam to dam, 145 feet across at its widest point and has a surface area of 3 acres. An average of 32 million gallons of water flows from the Springs each day. Since recordkeeping began in 1894, the flow rate has ranged from 6 million gallons a day in 1956 to 166 million gallons a day in 1961. 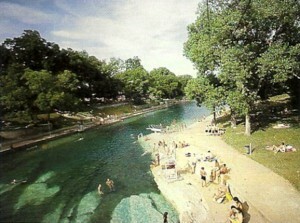 I learned how to swim at Barton Springs . . . and I learned a few other things there, too. Brrr! Perhaps thoughts of the icy cold waters of Barton Springs are responsible for the stoic expressions of these 1930’s lifeguards. Early settlers used readily available materials for construction. 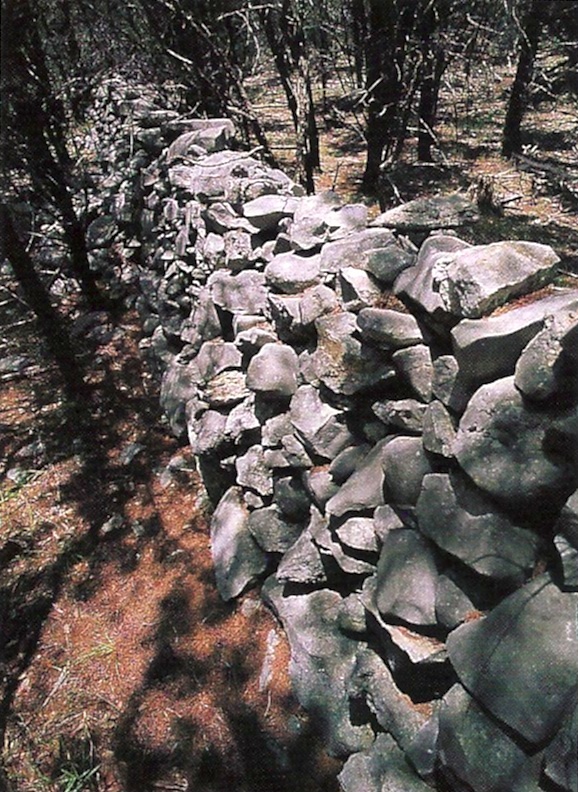 These rock walls have been standing for over 100 years. The first human to plunge into the chilly waters of Barton Springs probably did so more than 11,000 years ago – as the last great Ice Age was drawing to a close. Abundant animal life, sheltering limestone cliffs and the precious water of Barton Springs made the Barton Creek area a haven for native peoples. They probably hunted mammoth, bison, horses and other animals. They left behind bones and the implements of their survival – flint spearpoints and knives. In fact, the 120 square miles of the Barton Creek watershed are dotted with the cultural remains of many who settled here, or just passed through. These bits of debris, from arrow points and burned rocks to log cabins, tell vivid tales of the past. When studied properly, they tell us who lived here, and when. They tell us what they ate, how they prepared their meals and how they escaped the bite of the elements. Perhaps most importantly, relics from the past tell us that this small piece of Central Texas has played a central role in the lives of thousands of humans since before the dawn of civilization. Scientists have identified at least 274 archeological sites in the creek valley, including 188 that contain relics from prehistoric times. By about 5000 B.C., people became less nomadic. Instead of following and hunting large game, they began to hunt local small game and live off local plant life by gathering fruits, plant stalks, nuts and other edible flora. By about A.D. 1000, the native peoples began to use the bow and arrow, make their own pottery and engage in gardening. A few hundred years later, nomadic tribes of Comanche, Lipan Apache, Tonkawa and Jumano Indians visited the area. Archeologists have discovered the remains of their campsites near Barton Creek, and the records of early European settlers prove that there was frequent contact between the two cultures in the area. 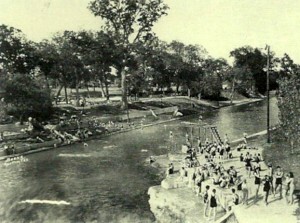 After Texas won its independence from Mexico, Anglo settlers also discovered the beauty of the Springs. In 1837, William Barton – “Uncle Billy” – settled on the land around the Springs. He named two springs for his daughters, Parthenia and Eliza. After Austin became the capital of the young Republic of Texas, the trickle of settlers became a torrent. They farmed the land along Barton Creek, built homesteads and raised families. Many of their early log cabins, fences and other structures still exist – and some probably remain hidden in the dense undergrowth that flourished when people stopped farming the land. The end of the 19th century brought about a new era. Barton Springs became a popular swimming hole; steamboats carried visitors upstream from Austin‘s small downtown; and the springwater powered an ice-making plant and a mill. The Springs no longer sustained the lives of those who inhabited the land, rather, they enriched them.